Starting in March 1999, the International Poster Journal of Dentistry and Oral Medicine has been published in cooperation with the German Society of Dental, Oral and Craniomandibular Sciences (DGZMK) and the Quintessence International Publishing Group. 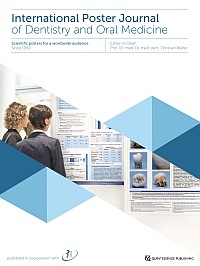 The quarterly publication is intended to serve as a medium for publishing prize-winning and peer-reviewed scientific posters in the field of Dentistry and Oral Medicine presented at international exhibitions. Our free notification newsletter helps you to stay informed. Every time a new issue is published, we will send you an e-mail including the table of contents. ... more issues at "Issues"